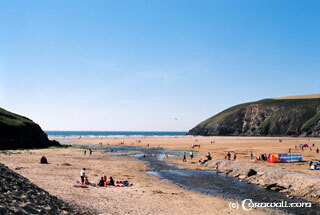 Watergate Bay is another fantastic sandy beach just a few miles North of Newquay. The beach is a favourite amongst the surfers as it is 2 miles wide and less crowded than Fistral. Watergate Bay was the film location of the recent ITV series Echo Beach starring Martine McCutcheon and Jason Donovan. The beautiful background pictures included in the series will only enhance its reputation as an upmarket destination. There are a number of places to stay including the Watergate Bay Hotel and some up market self catering apartments. Watergate Bay also boasts Celebrity Chef Jamie Oliver's 15 Cornwall Restaurant which opened in May 2006.